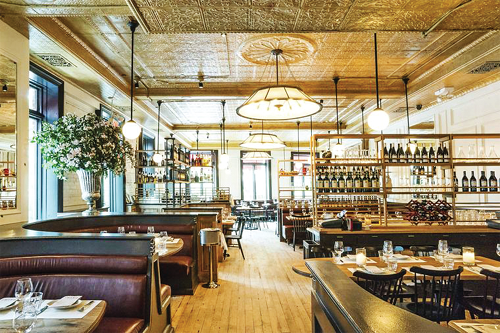 On Tuesday, Michelin released the 14th edition of its Bib Gourmand list for New York—also known as the acclaimed guide’s “cheap eats” list. The five boroughs scored 129 restaurants, including 27 new spots. That compares with last year’s 127 Bib Gourmands and only 14 new spots, which means a lot of places were taken off the list because they either closed, weren’t worthy, or moved up to Michelin-star status. Among the most notable restaurants to drop from this year’s list is the Spotted Pig, which has made headlines for sexual harassment allegations. The list also stands out for the number of new restaurants in Manhattan, at a time when Brooklyn and Queens account for most of the city’s dining buzz. Manhattan boasts 14 additions, representing more than half the newcomers. Among them is Una Pizza Napoletana, from pizzaiolo Anthony Mangieri and rising star chefs Fabian von Hauske and Jeremiah Stone. In fact, Michelin demoted Brooklyn: The borough now claims only 35 Bib Gourmands, down from 37 last year. Although part of the fun of a Michelin list is picking it apart, some of its entries are unassailable, like the explosive Thai spot Ugly Baby in Brooklyn. Another fun thing about the Bib Gourmand list is seeing how quickly it can become out date. In this case, the answer is instantaneously: Salt & Bone Smokehouse, known for its Fred Flintstone-style beef rib, has already closed in Queens and intends to operate a “ghost kitchen” for delivery only—a development in line with the dual trends of shrinking restaurants and virtual restaurants. (Some barbecue experts won’t be sorry; John Brown Smokehouse has better smoked meats and it fell off the list.) The Bib Gourmand list also includes Brooklyn’s Prime Meats, which has announced its closing in November. The number of destinations in Queens shot up to 19, from 15, with seven new Bib Gourmands when you take Salt & Bone off the list. The chief criterion for Bib Gourmand winners is that $40 per person can get you a meal that includes two courses plus dessert or wine, before tax and tip. (Although, if you put that to the test at several of these places, you’ll find that you’ll need a bit more cash if you want full rein of the menu.) The list is determined by anonymous Michelin inspectors who visit the restaurants in the course of determining their famous star rating system. This year’s number of relatively inexpensive spots in the city gently bucks the trend of a slow but steady decrease in notable new places. The Bib Gourmand guide included 132 restaurants in 2017 and 133 in 2016. Meanwhile, the price of an entree in New York continues to rise—witness the $92 lamb chops at the Grill. See the full list is below.